Alan Teggart scored Ballymena United's opening goal from the penalty spot in Saturday's win at Institute. Picture: Press Eye. Alan Teggart says Ballymena United’s players share the fans’ frustration that their run of form has come too late to salvage the season. 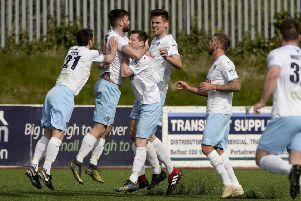 The winger scored the opening goal as the Sky Blues made it four successive wins in the Danske Bank Premiership, with a 2-1 success at Institute on Saturday. “We’re pleased with the run we’ve put together since the disappointment of the cup semi-final,” Teggart told Times Sport. “People say there’s nothing to play for but we know we let ourselves down in the semi-final where we just didn’t turn up. “Now we’ve got a wee bit of a run together and people might say ‘it’s only the bottom six’ but we still have to go out and win the games. Teggart’s goal set United on the way to a win which condemned Institute to the drop and the winger might be more disappointed than most to see the back of the Drumahoe men, after scoring penalties in three of the four games against them this season. McCutcheon’s spot kick came at a time when Teggart found himself on the bench for a spell but since the Irish Cup semi-final defeat by Portadown, Teggart has found himself back in favour, with manager Glenn Ferguson opting for more width in his line-up. “Glenn brought players in in January which made it more competitive and that is what you need. “It was all about biding my time and trying to get back into the team. I’m happy to be back playing and getting some game time again. “Every summer any manager will obviously look to strengthen his squad and build for the next season. “We’re under no illusions as players that Glenn will be looking to add players and build on what we have done this season,” added Teggart.